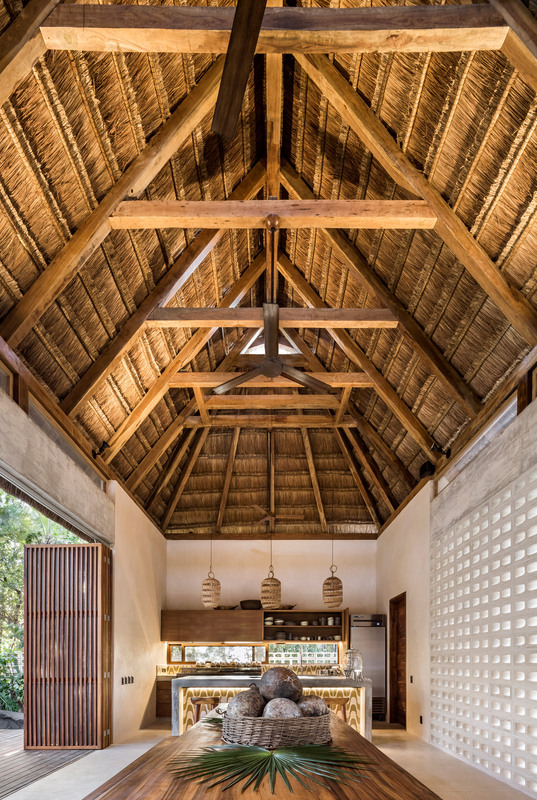 Palm leaf-lined ceilings meet wooden fixtures and furnishings inside this hotel in Tulum, which Jaque Studio has designed in reference to its verdant surroundings. 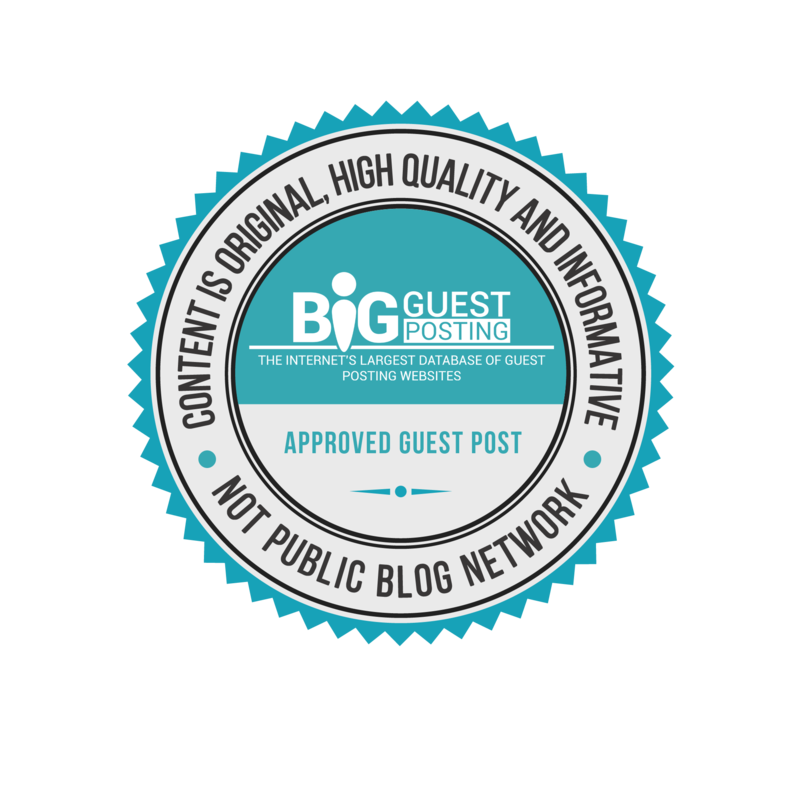 Jungle Keva comprises of just four 50 square-metre guest lodges, which have been dotted throughout a tree-filled plot of land to foster the same atmosphere of “being in a small village in the Mayan jungle”. This landscape directly informed the material palette applied throughout the hotel, which has been designed by Jaque Studio. “I get inspiration from the contemporary movement that has been developing in Mexico in the past 10 years, where there is a search for pure forms and natural materials that blend with the surrounding context,” Jesús Acosta, founder of the studio, told Dezeen. 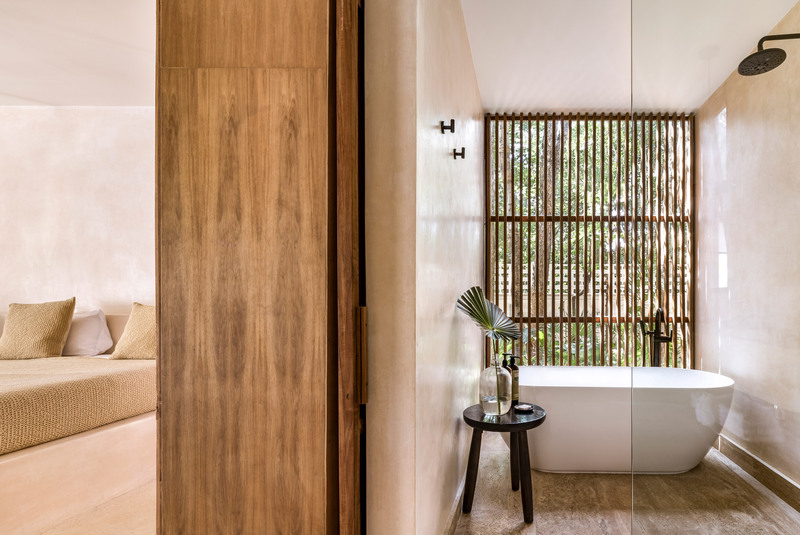 Aiming to preserve around 70 per cent of the site’s vegetation, the studio has constructed the guest lodges amongst clusters of existing trees. 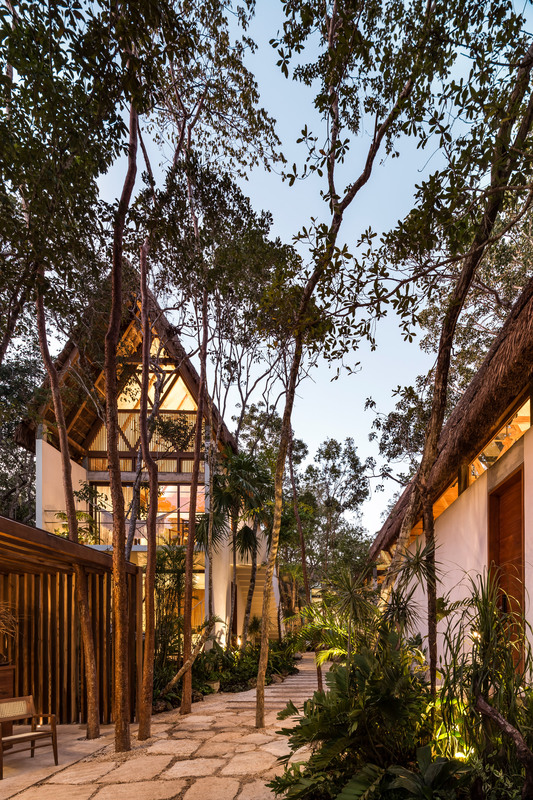 Each building features a pitched timber roof lined with palm fronds, and white walls made from Chukum – a type of stucco hailing from Mexico’s Yucatan region, which is a mixture of limestone and the resin of Chukum trees. The underside of the roof has been lined with a gold-hued textile woven from palm leaves, selected by the studio for its ability to let in natural light throughout the day. “The objective was to use materials that age with dignity, so that with the passing of time the architecture acquires character and a deeper sense of belonging,” added the studio. Internally there are double-height bedrooms, where mattresses are propped up on simple stone plinths. Decor has otherwise been restricted to tree stump side tables and exposed-bulb pendant lamps, which are suspended from the ceiling on lengths of thick rope. 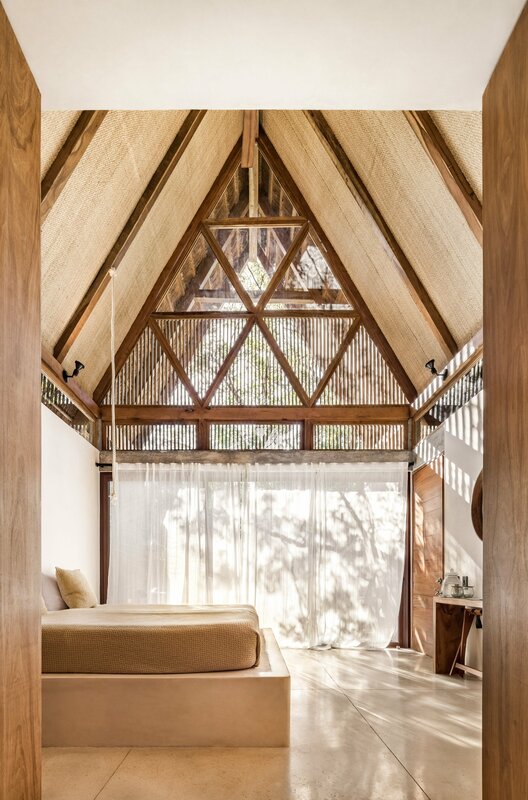 Large panels of glazing at the front of the lodges can be slid back to give access to small outdoor terraces complete with fringed hammocks where guests can lie back and relax. The studio erected a fifth lodge to accommodate the hotel’s communal areas. Inside a kitchen and dining area opens onto a sun lounging deck. 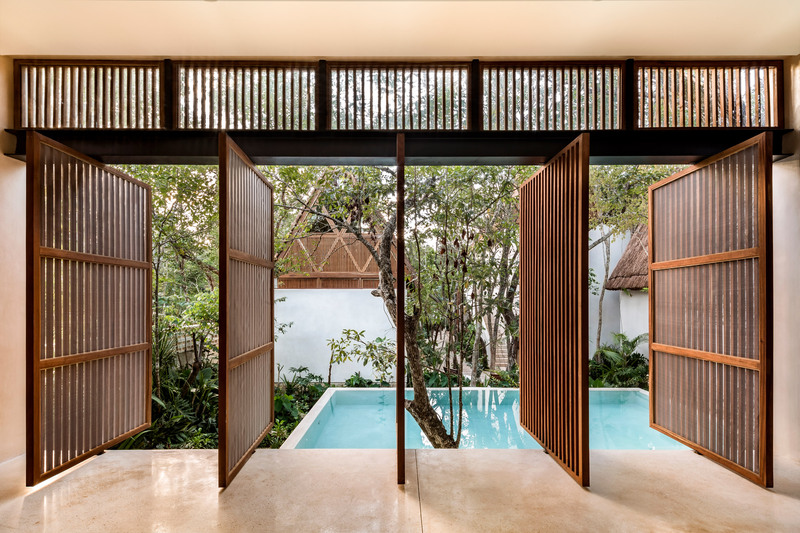 An adjacent yoga room fronted by slatted wooden screens cantilevers out over a pool, which has two mature Sapote rising up through its centre. 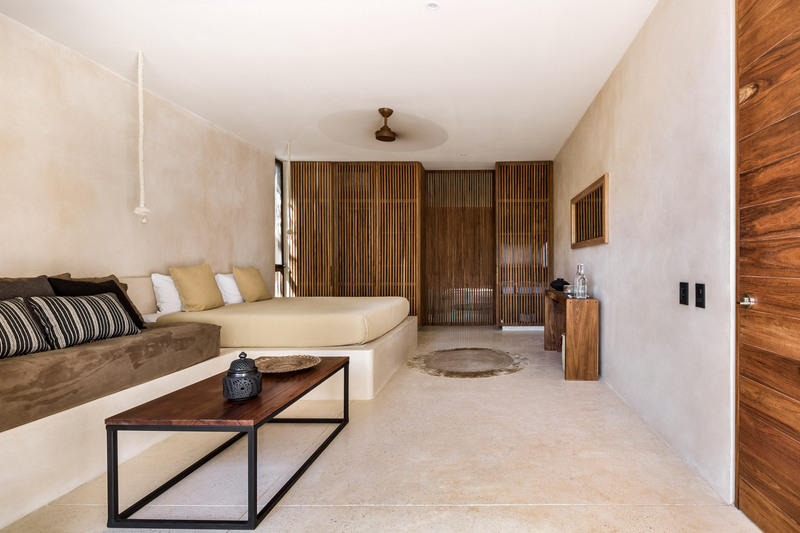 Hotels are increasingly springing up across Tulum, catering to throngs of visitors that are visiting the region for its rich history and unspoilt beaches. 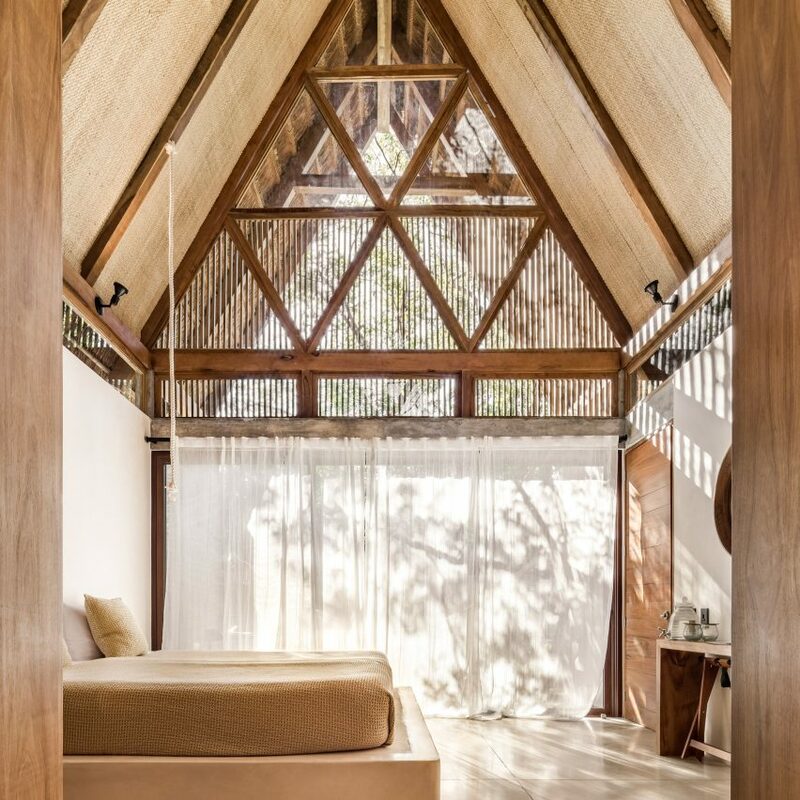 Just the past few years have seen the opening of Habitas Tulum, a contemporary retreat that directly overlooks the Caribbean Sea, and Tulum Treehouse, a white-concrete guesthouse enclosed by dense tropical foliage. Photography is by Cesar Béjar. 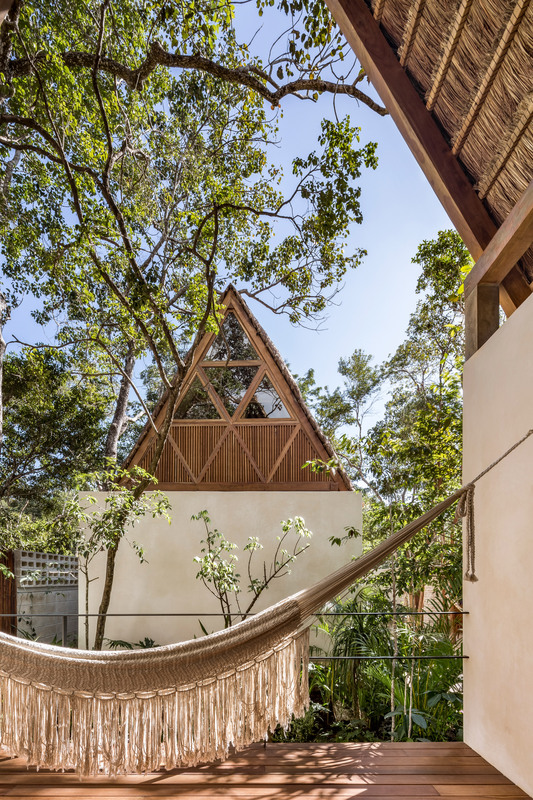 The post Jaque Studio creates “small village” of guest lodges for Tulum’s Jungle Keva hotel appeared first on Dezeen.